Designed and built in house by Curtis Technology, this CPCI card performs two tasks. 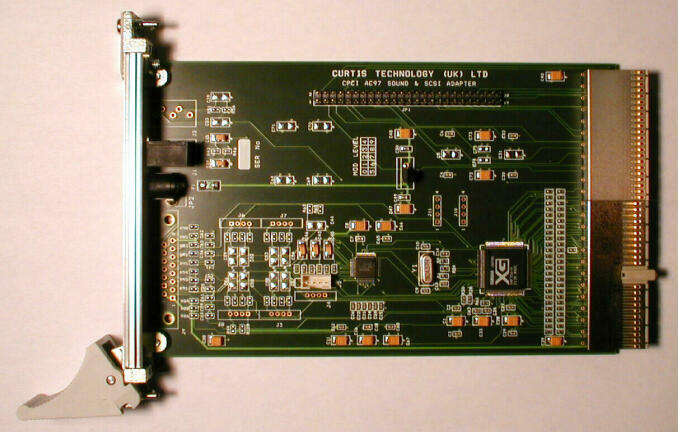 Firstly, it provides access to the SCSI interface provided by the CPU card via the CPCI backplane. SCSI access is required by both the Fujitsu MO, and Panasonic DVD-RAM storage devices. Secondly, this CPCI card provides full audio capability compatible with the industry standard Sound Blaster specification. Based upon the Yamaha YMF754 PCI audio controller, and the Yamaha YMF743 codec device, the audio card accepts analogue audio from the DVD-RAM drive, and provides an analogue audio output via the front panel headphone 3.5mm stereo connector. A 2.1mm barrel socket is provided to supply the 12v DC required to power the RF cordless stereo headphones supplied with Sonar 2031.